INSIDE THE CHURCHES THAT ARE LEADING NEW YORK’S SANCTUARY MOVEMENT | "Global Possibilities"
New York’s sanctuary movement is ready to become more radical. The question is, How? On the Tuesday after the election, two dozen pastors gathered in the back room of a Lower Manhattan church to begin plotting the resistance. 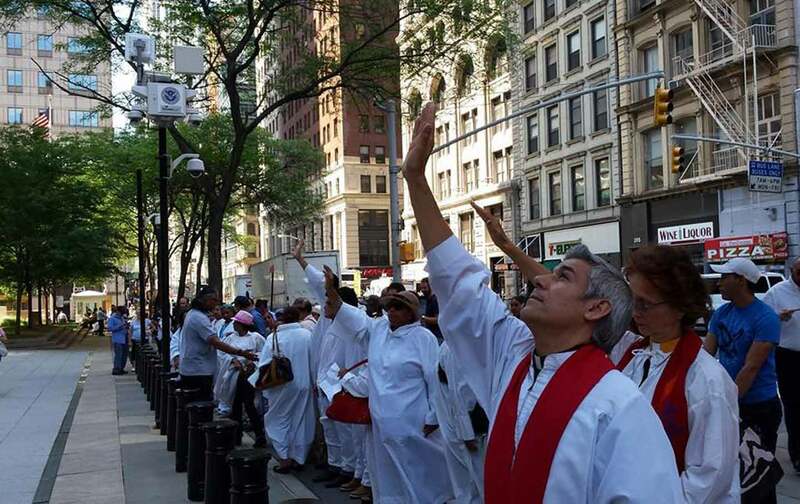 Most of the faith leaders were immigrants, and all of them members of the New Sanctuary Coalition of New York City, an interfaith network of congregations, organizations, and activists. Since its founding in 2007, the coalition has worked on the front lines in the fight to protect undocumented New Yorkers from detention and deportation. The meeting began with a prayer—“We pray you will give us all the right to remain in justice, in solidarity and in truth”—delivered by a soft-spoken Mexican priest, first in Spanish, then in English. Updates from the past week followed—reports of congregations in crisis, sleepless nights spent consoling worried parents, tearful children afraid to go to school. The mood was tense but focused, and before long they’d arrived at the main item on the agenda. Since it emerged nine years ago, the coalition has acted in two distinct capacities. Publicly, they advocate for the city’s undocumented residents, lobbying for reforms while hosting legal clinics and solidarity events. Many of the group’s best known actions, like their monthly prayer walk around Federal Plaza to protest deportations, fall into this category. The second capacity, called physical sanctuary, is more discreet. Premised on the quasi-legal expectation that federal agents will not raid houses of worship, physical sanctuary is the act of secretly housing immigrants facing deportation. Sometimes the tactic is used to provide a temporary safe haven during an overnight raid, while other times it involves housing an immigrant for months as they await a court ruling. At least eleven Christian congregations in the city currently offer physical sanctuary. The present situation, Ragbir noted, is that the United States is currently expelling immigrants at a rate unprecedented in history. Under Obama, at least 2.4 million immigrants have been deported—a 21 percent jump from the previous record, held by George W. Bush. And these raids aren’t just happening in border states, like Arizona and Texas. Just a few weeks before the election, Immigrations and Customs Enforcement (ICE) agents rounded up 25 undocumented workers during a raid on four restaurants in Buffalo. Such workplace sweeps were especially common during the Bush years, and as the legal director of the New York Immigration Coalition recently told The New York Times, the model may serve as a blueprint for the coming administration. Should President Donald Trump decide to ramp up deportations—as he has repeatedly promised—there’s very little the rest of the government could do to stop him. While he’ll need funding from Congress to increase the size of ICE, there are currently 14,000 ICE officers, agents, and special agents already in place. In the past, only a fraction of those officers have worked on tracking down undocumented immigrants, but a single memo from President Trump could reshape the focus of the agency overnight. The gathered faith leaders were painfully aware of the human cost of such an amped-up deportation regime. They know firsthand what it’s like to lose members of their community to ICE sweeps—to watch a parishioner banished to Mexico, forced to leave behind her two children, Michel and Heidy, ages nine and 13; to see a Haitian father of four sent to an immigrant detention center for a twenty-year-old drug conviction. In some cases, the coalition has blocked these measures by working through the available legal channels. In others, a more creative approach has been necessary. The stakes are higher now than ever. “We are here today to talk about our rights,” Ragbir began, a translator helping him reach the mostly Spanish-speaking crowd. “And to answer your questions of what comes next.” Over chicken noodle soup, Ragbir and his fellow organizers did their best to address the concerns of the group. These questions were different than the ones they’d fielded Tuesday—less focused on the future of resistance than the pressing issues of the moment. One woman wondered if ICE could access the data she’d turned over to IDNYC, the municipal identification card used by many undocumented New Yorkers. Another spoke of her husband, currently awaiting a court hearing at a New Jersey immigrant detention facility, and the impact that Trump’s presidency could have on him. The most common fear was about the Deferred Action for Childhood Arrivals (DACA) initiative, an executive action issued by President Obama in 2012 to provide temporary work authorization and deportation protections to the children of undocumented immigrants. Donald Trump has promised to “immediately terminate” the action, though it remains unclear what that would mean for the roughly 800,000 young immigrants currently receiving DACA protections. For Judith and so many others, this is the frustrating new reality: While Trump’s most incendiary rhetoric may be aimed at immigrants, he remains defiantly ignorant of the complex web of laws and executive actions that govern our immigration system. That may seem like a rhetorical question, but it’s not. In Judith’s view, the ultimate goal of the sanctuary movement is to create a universal solidarity with immigrants, even among those who’d like to see her expulsion. It’s a radical idea, but one grounded in a lifetime of faith and activism.